You are here: Home / What Foods are Kosher for Passover? I put together this simple guide to help you better understand what foods are considered Kosher for Passover. Passover is observed for seven days in Israel and eight days in the Diaspora. During Passover, the Jewish kosher laws become a lot more challenging. Leavened and fermented grain products are prohibited to commemorate our freedom from Egyptian slavery. When the Jews escaped Egypt (led by Moses), they didn’t have time to let their breads rise before going into the desert. 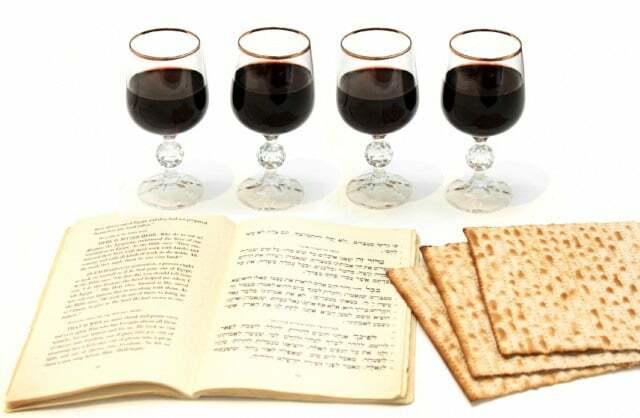 Because of this, any type of leavened bread or bread product is prohibited during Passover. These leavened products, known as chametz, include certain grain-based foods like breads, pasta, pastries, breadcrumbs, crackers, etc. Unleavened bread, aka “matzo,” traditionally takes the place of chametz during Passover. What foods are forbidden during Passover? Certain meats may not be eaten. Forbidden meats include (but are not limited to): pork, shellfish, lobster, shrimp, crab, rabbit, and seafood without fins or scales (like swordfish and sturgeon). Also, any products made with ingredients from these meats (example—pig ingredients in non-kosher gelatin) cannot be used. Meat must not be eaten in combination with dairy. So, no cheese, butter, or cream sauce on your beef or chicken dish. Fish and eggs are considered neutral. They can be served with dairy or with meat. For more details on these basic kosher restrictions, click here. These grains are prohibited if they’ve had contact with water/moisture for longer than 18 minutes, which leads to rising or “leavening.” Leavening agents, like yeast and sourdough, are also considered chametz. You might be thinking– but, isn’t matzo made from wheat flour? Yes! Most matzo is made from wheat, but the process used to “cook” the matzo from the time liquid is added to the flour to the time the matzo is baked can last no longer than 18 minutes. The wheat is closely supervised to ensure that no water touches it from the time of harvest to the time it is baked. This is to make sure that no leavening occurs. This is all technicality, and it may seem confusing to somebody who is new to keeping kosher for Passover. The most important thing you need to remember is that grain-based products… even beer!… are generally not considered kosher for Passover. Matzo, matzo meal, and matzo cake meal are used as substitutes for bread, bread crumbs, and cake flour, respectively. Most Jews in America do not consume kitniyot during Passover. So, unless you’re absolutely sure that the people at your Seder observe Sephardic traditions, it’s safest to avoid cooking any kitniyot items during the Passover holiday. In addition to these restrictions, many Jews avoid eating lamb during Passover because of the paschal sacrifice and Passover symbolism of the lamb shank bone. Some Jews also avoid garlic, though this is more rare. Neither of these rules are observed universally, however. So… what exactly can I eat on Passover? – Beef, chicken, turkey, duck, goose, or fish with scales. If keeping strictly kosher, the meat must be kashered by a kosher butcher or sold as a kosher cut of meat. – Dairy products, like cheese, yogurt, and kefir, are acceptable when they are not mixed with additives (like corn syrup). Dairy products cannot be mixed with meat. – Quinoa. While somewhat controversial, most sources agree that quinoa is not technically a grain, and therefore it is permissible on Passover. – Spices. Note that I do not consider spices like cumin and coriander to be kitniyot, so they may appear in Ashkenazi categories throughout the site. – Any packaged or processed product with a Kosher for Passover hechsher (stamp of approval from a kosher organization) is considered acceptable for Passover consumption. Keep in mind that those keeping strictly kosher will look for a Kosher for Passover hechsher on any and all packaged food products used during Passover, including dairy products, nuts, broths, quinoa, spices, and even matzo products (not all of them are labeled Kosher for Passover!). To learn more about hechshers, click here. – Gebrokts – The word gebrokts translates from Yiddish to “broken,” and it has come to mean “wet matzo.” A small minority of kosher Jews (mostly chassidic) will not mix water with cooked matzo during the Passover holiday. The custom arrises from the concern that a small amount of flour may still exist on the matzo after baking, resulting in chametz when the flour makes contact with liquid. This means they will not cook with matzo or matzo meal, or make dishes like matzo ball soup. For the purposes of this website, most of the Passover recipes will not work with those who keep the gebrokts tradition, as it is only observed by a small percentage of kosher Jews. Is there an easy way to tell if a product is available with a Kosher for Passover hecsher? You may want to use a packaged/processed product in your recipe– like chocolate syrup, for example. And you might wonder if this particular product is available in a Kosher for Passover form. Many packaged products have kitniyot or chametz hiding in them (example—wheat gluten in soy sauce, corn starch in powdered sugar, etc.). You can do a quick search in the OU Database to find out. Click this link to be taken to the database. Select the box for “Passover,” then enter the name of the product you are searching for (example- chocolate syrup). If a product is available in kosher for Passover form, the brand names will come up in this database. Not every product shows up here, so if you don’t find it in the database, you can do a Google search to see if the product you’re looking for is available under a different kosher hechsher (ex.- “kosher for Passover soy sauce”). I am not an authority on the kosher laws. I do not personally keep kosher in the strictest sense. I educated myself on this subject during my conversion and as I developed my website. I put together this guide for people who are new to Passover and kosher observance. If you have further questions, the best thing to do is contact a trusted Rabbi. To learn more about the Passover holiday, and why our restrictions change during this time of year, click here.